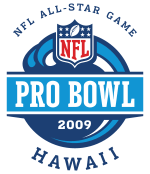 The 2009 Pro Bowl was the National Football League's all-star game for the 2008 season. It was played at Aloha Stadium in Honolulu, Hawaii on February 8, 2009. This was the most recent year that the game was held after the Super Bowl. The NFC defeated the AFC, 30–21. The AFC was coached by Baltimore's John Harbaugh, while the NFC's coach was Philadelphia's Andy Reid. ↑ "NFC rallies in fourth quarter to knock off AFC in Pro Bowl". NFL.com. 2009-02-08. Archived from the original on 22 December 2009. Retrieved 2010-01-07. ↑ Acee, Kevin (2009-01-21). "Rivers passing on Pro Bowl". San Diego Union-Tribune. Retrieved 2010-01-20. Wikimedia Commons has media related to 2009 Pro Bowl.